Malayalam Megastar Mammootty is going all set to enthrall the Tollywood audience by essaying the role of beloved leader YSR in ‘Yatra’ movie which is going to be the biopic on Dr. Y S Rajasekhara Reddy. Mahi V Raghav is helming this project and the expectations on the movie are increasing day by day. The makers are leaving no stone unturned in creating a huge buzz around the film. 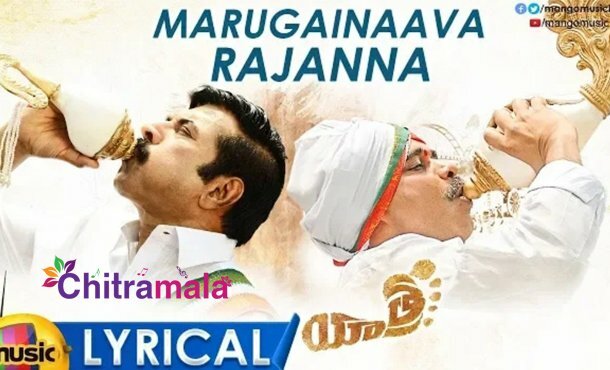 After grabbing the attention with the trailer of the movie, the makers have now come up with the lyrical video of ‘Marugainaava Rajanna’ song from the movie. The lyrics written by Penchal Das are really emotional and beautiful. He himself has sung the song. His voice is wonderful. The music by K is excellent. We can expect pleasant music and songs from the film. Vijay Chilla and Shashi Devi Reddy are bankrolling this project under 70 MM Entertainments banner. The movie is slated to hit the screens on February 8th, 2019.